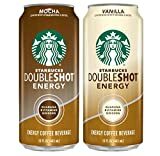 Starbucks Double Shot Energy + Coffee is a canned coffee energy drink hybrid distributed by PepsiCo. Double Shot Energy + Coffee contains coffee and other energy ingredients like guarana. All flavors list the same caffeine content. As far as energy drink ingredients Double Shot Energy + Coffee contains per 15 fl oz. can; 1800mg of Taurine, 450mg of L-Carnitine, 180mg of Inositol (also known as B8), 325mg of Ginseng, and 90mg of Guarana. Look here for the complete caffeine content of all Starbucks beverages. 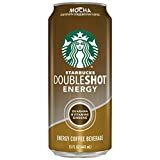 Starbucks coffee (water, coffee), reduced fat milk, skim milk, sugar, natural flavor, maltodextrin, dextrose, taurine, cellulose gel, panax ginseng root extract, cellulose gum, inositol, sodium ascorbate , guarana (paullinia cupana) seed extract, niacinamide, sucralose, ascorbic acid (vitamin c), tricalcium phosphate, pyridoxin hydrochloride (vitamin b6), riboflavin, vitamin a palmitate, vitamin d3. Sugar content: 26 grams (per 15 ounces). 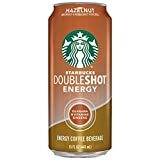 How Does Starbucks Doubleshot Energy + Coffee Compare? 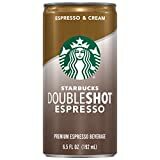 Starbucks Doubleshot Energy + Coffee contains 9.67 mgs of caffeine per fluid ounce (32.69mg/100 ml).